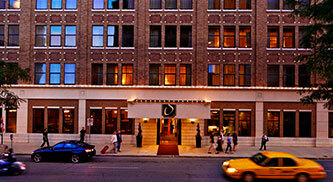 Premier location and unparalleled amenities. Stately architecture and rich heritage. While all these qualities make Hotel Winneshiek unique in Decorah, our warm welcome and passionate embrace of the community give Hotel Winneshiek a quality of hospitality unique unto itself. Situated in the heart of Decorah, Hotel Winneshiek is part of a thriving main street full of local shops, restaurants, galleries, parks and unique attractions like the Vesterheim Museum. The hotel also offers the region’s best wedding and event venues, including the historic Opera House, with its original tin walls and ceiling, beautiful mezzanine level and dramatic stage. Blending 21st Century comfort with 19th Century charm, Hotel Winneshiek offers amenities ranging from free Wi-Fi and live music in the marble and terrazzo lobby, to locally-sourced cuisine in Restauration restaurant, and handcrafted cocktails in our intimate lounge. From the day it opened in 1905, Hotel Winneshiek set a standard for elegance that has yet to be exceeded. Then, as today, guests entered through tall mahogany doors set between limestone pillars, passing through a vestibule and arcade before entering the three-story octagonal rotunda canopied by a stained glass ceiling. 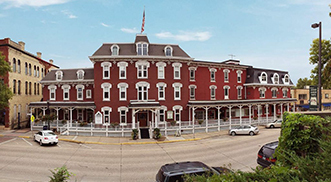 More than a century later, Hotel Winneshiek gleams brighter than ever, honoring the past while exuding a vitality that will make every stay a treasured part of your own history. Recognizing the important role that historically significant properties play in sustaining communities, Rebound Hospitality brings expertise in hospitality management, financial oversight and leadership development to its growing collection of unique hotels and inns. Loved by locals and a favorite with guests, the Archer House embodies the charm and heritage of Northfield. Check in, breathe out. You’ve found the perfect hotel, featuring the city’s largest guest rooms and so much more.